This blog article is adapted from and contains excerpts from a PhD research thesis completed during late 2017 at Deakin University by Dr. Williamson titled: Australian Wheatbelt Farmers’ and NRM Responses to Ecological Principles, Climate Change, Agricultural Production and Biodiversity Effects at a Landscape Scale. References are provided at the end for the Author’s article. For references bracketed within quotations from other authors, please refer to their original articles for those references. © Dennis N. Williamson and Geoscene International (a division of Scenic Spectrums Pty Ltd) 2018. Unauthorized use and/or duplication of this material without express and written permission from this site’s author and/or owner is strictly prohibited. Excerpts and links may be used, provided that full and clear credit is given to Dr. Dennis N. Williamson and Geoscene International (a division of Scenic Spectrums Pty Ltd) with appropriate and specific direction to the original content. Can you imagine Australia without cassowaries, cockatoos, dingoes, koalas, platypus, or Tasmanian devils? Or without boab, bottlebrush, casuarina, coolibah, ghost gum, mallee, red gum, snow gum or stringybark trees? Or without grass trees, grevillias, kangaroo paws, waratahs, spinifex, or Stuart's desert peas? Or without many of the other iconic and even lesser known flora and fauna species that make this continent one of the most unique places in the world? Figures 1 - 4 provide just a glimpse of some of these species and ecological communities. These other species are not human, but in many ways they really are an extension of us. They are part of the quintessential Australian landscape and experience. They are deeply imbued in Australian art, music, literature and tourism. To us, they are as much cultural as they are biological. They are part and parcel of what makes Australia 'Australia'. In recent times, however, a great deal of concern has been expressed by ecologists and environmentally-minded Australians and organisations that we are in danger of losing a high percentage of many Australian native plant and animal species due to the combined effects of habitat fragmentation, climate change and other factors. There have been outcries for and against changes in legislation that make it easier for private landholders to clear remnant native vegetation. Concerns have also been expressed about inadequately administered and applied environmental legislation, such as Australia's Environmental Protection and Biodiversity Conservation Act 1999, that are intended to protect indigenous species and ecosystems. However, many of the arguments put forward in newspaper and magazine articles and in the social media tend to focus narrowly on the plight of specific species, local areas or regions. They do not always provide the full context of the history of species loss in Australia or the underlying reasons as to why such species and ecosystems are so fragile and precariously balanced at this point in time. In order to communicate and prosecute the case for better ecological stewardship in Australia, we need to foster a more complete view of the implications at hand for all concerned - the public, landholders, land developers, corporations and politicians. This article focuses on the historical background, the interplay of native vegetation clearing and climate change, and the implications of these threats not only on native species, but on the health of our land, on agricultural productivity and on Australians as a society and individuals. Serious concerns about recent vegetation legislation in the States of New South Wales and Queensland that either reduce the regulation and controls over native tree and vegetation clearing for agricultural purposes (as in NSW) or that tighten such regulations (as in Queensland) have been a hot topic in recent times. In addition, there has also been concern over the lack of listing of critical habitat for threatened species under the EPBC Act 1999. Articles on these topics have appeared in various Australian newspapers (as well as in several posts on Facebook and LinkedIn) addressing these issues specifically. Most of the concerns expressed centre around the themes of “Habitat Fragmentation” and “Species Loss”, or alternatively, infringements on farmers’ rights to manage their own land. In applying conservative methods of estimation, the indications are that losing ‘critically endangered’ species would tip the scales and create a state of mass extinction of a similar level to the previous five mass extinction events due to ‘perfect storm’ conditions caused by “multiple, atypical high-intensity ecological stressors, including rapid, unusual climate change and highly elevated atmospheric CO2”. Many ecologists believe that rapid changes in climatic conditions will place 20%-50% of the world’s flora and fauna species at risk of extinction or significant population depletion if a mean temperature increase of 2°C above pre-industrial period mean temperatures occurs by 2030, and as high as a 50-60% loss of species by 2100. Regions with the types of biomes found in Australia would risk higher levels of extinctions than other areas of the world. Over only the first 200 years of European settlement in Australia, clearing of forests and woodlands for agricultural grazing and cropping left the nation with forest cover that was equivalent to that found in northern hemisphere regions that had been farmed extensively for thousands of years. - 4 percent (71,458 ha) due to other activities (primarily urban and infrastructure development). The Barson report shows that clearing from 1991 – 1995 accounted for more than 50% of the total land cover change and 77% of the clearing that contributed to greenhouse gas emissions in the land use change sector of the National Greenhouse Gas Inventory during that period. - and in the Western Australian wheatbelt. only remnants of the grassy woodlands of eastern Australia remain and the southern eucalyptus woodlands have been most greatly affected. the degree of contrast of remaining habitat patches with the surrounding landscape matrix. 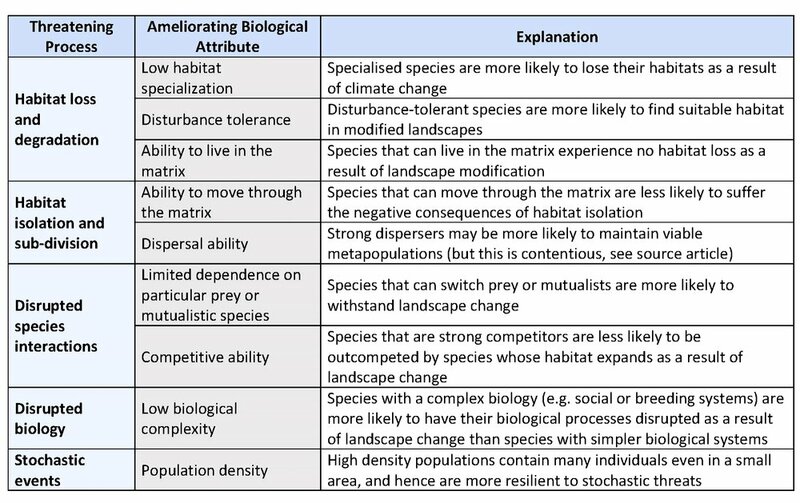 Fischer and Lindenmayer’s suggested relationships between the various threatening processes and species biological ameliorating attributes are as outlined in Table 1. The Western Australian experience demonstrates the importance of remnant native vegetation cover on private lands and the effect of habitat fragmentation on habitat condition and quality. The Department of Environment and Energy’s Threatened Species Scientific Committee reports that following a 71% decline in total vegetation cover from the pre-European extent, the proportion of the remaining native vegetation for the region on private land is 37.5%, with 8.5% on leasehold properties. The balance of remnant vegetation is contained on WA Parks and Wildlife (Dept. of Biodiversity, Conservation and Assets) managed conservation reserves or on other public lands (including road reserves). The fragmentation levels of the remaining native vegetation in the WA Wheatbelt Woodland are shown according to the number of patches in four different categories of size in Table 2. The Committee’s report notes that 89% of the remaining remnants consist of 12 dominant vegetation associations of which 93.5% are in patches of ten hectares or less, and two-thirds of those are patches of 1 ha or less. Current median patch sizes of 0.48 ha compare to pre-1750 estimated median patch sizes of 150 ha. The Committee’s report included an assessment of bushland condition as assessed by the WA Department of Parks and Wildlife for remnants that had been registered for the Land for Wildlife program. The relative percentage of each size category of the remnants assessed as excellent, good or poor-moderate. This data is shown in Figure 8, reflecting how the quality of remnant vegetation for habitat markedly decreases as the patch becomes smaller. It is important that the issues surrounding the listing of the Wheatbelt Woodlands on the EPBC Act’s listing of threatened species are not limited to habitat loss and species distinction. Salinity has become a major problem in the WA wheatbelt, affecting a total of 54.6% of farms in the region. In extreme cases, the soils had become so contaminated that farming need to cease or become less productive. Tree clearing has also been associated as a causal factor in reduced precipitation. In a 2013 study by Andrich and Imberger, they compare Western Australian coastal and inland rainfall to show empirically that 55% to 62% of the observed rainfall decline is the result of land clearing alone. The reduced precipitation and rising temperatures associated with climate change are also cited as the cause of a drop in Australian wheat yields/ha by 27% from 1990 to 2015 is attributed to rising temperatures and significant falls in annual precipitation levels. Ironically, agricultural land use and related vegetative clearing accounts for 21% of global greenhouse gas (GHG) emissions driving adverse climatic effects and about 33% of Australia’s GHG emissions. protect core areas to protect all threatened ecosystems and species, as well as to provide refugia for species against the effects of climate change by 2030. The NRSTG believe that by protecting more ecosystems sooner, the prospect for more species adapting to and surviving climate change will increase. Again, the strategy emphasises the need for the protection of ecosystems and species beyond the borders of public reserves, incorporating the broader landscape. “Organisms maximize their fitness at an ‘optimal’ environmental range and can survive only short periods in environmental conditions that exceed a threshold in their ‘critical tolerance limits’." In a presentation to the NCCARF 2013 Conference, VanDerWal stressed that many faunal species are likely to reach their critical tolerance limits when temperatures exceed two standard deviations of change in temperature within their physiological performance curves. This is likely to happen if mean temperatures rise by 2.3oC or greater. As discussed above, the BOM and CSIRO report shows that very warm months in Australia now create two standard deviations in temperature increase from the mean 11% of the time without reaching an average temperature increase of 2.3oC, as VanDerWal suggests. The frequency of this two standard deviation change has increased by 9% from nearly 40 years ago. For additional information regarding the physiological limitations and bioindicators of fauna in relation to temperature increases and climate change, see articles by Frapell and Daniels, and Holt and Miller. In most regions, climate change refugia provided to indigenous flora and fauna is inadequate without additional habitat and connectivity provided within rural road reserves, stream reserves and on private farmlands. The above discussion underscores the importance of protecting, maintaining and restoring native vegetation cover and ecological habitats across Australia, particularly on private lands outside existing conservation reserves. If we don’t do so, we are apt to lose a high percentage of the indigenous flora and fauna that give Australia its special character. This is the background to why vegetation clearing and habitat fragmentation are of such great concern. a set of simplified key ecological principles drawn from the ecological literature that can be understood and applied by rural landholders while maintaining agricultural productivity and enhancing environmental services to themselves and the broader community. Source: The Echo NetDaily, 2013. Outlook bleak for Carnaby’s black cockatoo. Article (7 November). Online. Weblink: http://www.echo.net.au/2013/11/outlook-bleak-for-carnabys-black-cockatoo/ (Accessed 15 February, 2017). Source: Adlaya, 2013. “Honey Possum (Tarsipes rostratus) photo.” In: Our Wild World Blog. Online. Weblink: https://adlayasanimals.wordpress.com/2013/08/07/honey-possum-tarsipes-rostratus/ (Accessed 15 February, 2017). Department of Natural Resources, 2015. Native plant - Coloured spider-orchid. Fact Sheet, Nationally endangered, Threatened flora of the South Australian Murray-Darling Basin. Adelaide: Government of South Australia, 2 pp. [Online. Weblink: http://www.naturalresources.sa.gov.au/samurraydarlingbasin/publications/native-plant-coloured_spider-orchid (Accessed 15 April, 2017)]. Slezak, Michael, 2018. 'Global deforestation hotspot': 3m hectares of Australian forest to be lost in 15 years in The Guardian, 5 March, 2018: https://www.theguardian.com/environment/2018/mar/05/global-deforestation-hotspot-3m-hectares-of-australian-forest-to-be-lost-in-15-years (Accessed 8 March 2018). Cox, Lisa, 2018. Australia has 1,800 threatened species but has not listed critical habitat in 10 years in The Guardian, 6 March 2018: https://www.theguardian.com/environment/2018/mar/06/australia-has-1800-threatened-species-but-has-not-listed-critical-habitat-in-10-years (Accessed 8 March 2018) NSW Government, 2017. State Environmental Planning Policy (Vegetation in Non-Rural Areas) 2017. Weblink: https://www.legislation.nsw.gov.au/#/view/EPI/2017/454/full (Accessed 16 March 2018). Phelps, Mark and Lucy Kinbacher, 2018. “Palaszczuk delivers new anti-farmer vegetation laws” in Queensland Country Life, 8 March 2018. Weblink: http://www.queenslandcountrylife.com.au/story/5273918/vegetation-palaszczuk-belts-farmers-with-new-tree-laws/ (Accessed 16 March 2018). Hannam, Peter, 2018. “Bungled': NSW new land-clearing laws deemed invalid by court” in the Sydney Morning Herald, 9 March 2018. Weblink: https://www.smh.com.au/environment/conservation/bungled-nsw-new-land-clearing-laws-deemed-invalid-by-court-20180309-p4z3lf.html (Accessed 16 March 2018). Salam, Carolyn, 2018. “Vegetation clearing changes back on the agenda, with retrospective effect” in LinkedIn, 13 March 2018. Weblink: https://www.linkedin.com/pulse/vegetation-clearing-changes-back-agenda-retrospective-carolyn-salam Note: Salam’s article is in reference to: The Vegetation Management and Other Legislation Amendment Bill 2018(VMOLA Bill) was introduced into Queensland Parliament on 8 Marc(Accessed 16 March 2018). Department of Environment and Energy, 2017. Canberra: Australian Government. Online. Weblink: http://www.environment.gov.au/topics/biodiversity/biodiversity-conservation (Accessed 7 April 2017). Woinarski, John C. Z., Andrew A. Burbidge, and Peter L. Harrison, 2015. “Ongoing unraveling of a continental fauna: Decline and extinction of Australian mammals since European settlement”. In Proceedings of the National Academy of Sciences of the U.S.A., Washington D.C.: PNAS, p. 1. Barnosky, Anthony D., Matzke, Nicholas, Tomiya, Susumu, Wogan, Guinevere O. U, Swartz, Brian, Quental, Tiago B., Marshall, Charles, McGuire, Jenny L, Lindsey, Emily L., Maguire, Kaitlin C., Ferrer, Ben Mersey, and Elizabeth A. Ferrer, 2011. “Has the Earth’s sixth mass extinction already arrived?” Review Nature. 471 (7336): 9–11. Cooper, Catherine, and Fran Dorey, 2015. What Are the Impacts of Climate Change? Online. Canberra: Australian Museum. Online. Weblink: http://australianmuseum.net.au/what-are-the-impacts-of-climate-change, (Accessed 29 November 2016). Maclean, Ilya M. D., and Robert J. Wilson, 2011. “Recent ecological responses to climate change support predictions of high extinction risk.” In Proceedings of the National Academy of Sciences USA, 108 (30):12337–12342. Source: Fisher A.M, and S.J. Harris, 1999. “The dynamics of tree cover change in a rural Australian landscape”. Landscape and Urban Planning 45: 203. Angelstram, P., and G.W. Arnold, 1993. “Contrasting roles of remnants in old and newly impacted landscapes: lessons for ecosystem reconstruction.” In: Nature Conservation 3: Reconstruction of Fragmented Landscapes, edited by Saunders, D.A., R.J. Hobbs, and P.R. Ehrlich, P.R., Chipping Norton, New South Wales: Surrey Beatty & Sons, pp. 109 - 125. Barson, M. M., L. A. Randall, and V. Bordas, 2000. Land Cover Change in Australia. Results of the collaborative Bureau of Rural Sciences - State agencies’ Project on Remote Sensing of Land Cover Change. Canberra: Bureau of Rural Sciences, 92 pp. Morton, Steve, Andy Sheppard, and Mark Lonsdale (eds. ), 2014. Biodiversity: science and solutions for Australia. Collingwood, Victoria: CSIRO Publishing, pp. 39-40. Bradshaw, Corey J.A., 2012. “Little left to lose: deforestation and forest degradation in Australia since European colonization.” Journal of Plant Ecology 5 (1): 109–120. Source: Cox, Stephen J., Dominic P. Sivertsen, and Michael Bedward, 2001. “Clearing of native woody vegetation in the New South Wales northern wheatbelt: extent, rate of loss and implications for biodiversity conservation.” Cunninghamia 7(1): 115-116 (Figures 7 and 9). Source: Department of Environment and Energy, 2015. “Appendix C: Description of Key Threats, Environment Protection and Biodiversity Conservation Act 1999 (EPBC Act).” In: Approved Conservation Advice (including listing advice) for the Eucalypt Woodlands of the Western Australian Wheatbelt. Canberra: Australian Government Data collated by DPaW (2013), p. A48 (Figure C2). Didham, Raphael K., 2010. “Ecological Consequences of Habitat Fragmentation.” In: Encyclopedia of Life Sciences (ELS). Chichester: John Wiley & Sons, Ltd, pp. 1-11. Fischer, Joern and David B. Lindenmayer, 2007. “Landscape modification and habitat fragmentation: a synthesis.” Global Ecology and Biogeography 16:265-280. Source: Fischer, Joern and David B. Lindenmayer, 2007. “Landscape modification and habitat fragmentation: a synthesis.” Global Ecology and Biogeography 16:270. Department of Environment and Energy, 2015. “Appendix C: Description of Key Threats, Environment Protection and Biodiversity Conservation Act 1999 (EPBC Act).” In: Approved Conservation Advice (including listing advice) for the Eucalypt Woodlands of the Western Australian Wheatbelt prepared by the Threatened Species Scientific Committee. Canberra: Australian Government Data collated by DPaW (2013), p. A48 (Figure C2). Source: Department of Environment and Energy, 2015. Appendix C: Description of Key Threats, Environment Protection and Biodiversity Conservation Act 1999 (EPBC Act) Approved Conservation Advice (including listing advice) for the Eucalypt Woodlands of the Western Australian Wheatbelt. Canberra: Australian Government Data collated by DPaW (2013). Appendix D: Detailed Assessment of Eligibility for Listing Against the EPBC Act Criteria. (Data from the National Vegetation Information System, supplied by WA DPaW). Department of Environment and Energy, 2015. “Appendix D: Detailed Assessment of Eligibility for Listing Against the EPBC Act Criteria.” In: Approved Conservation Advice (including listing advice) for the Eucalypt Woodlands of the Western Australian Wheatbelt. Canberra: Australian Government, pp. A59 – A80. [Data supplied by the WA Department of Parks and Wildlife on native vegetation patches registered in the Land for Wildlife Program in the Avon Wheatbelt and Western Mallee regions, as at March 2015. Based on 671 sites with woodland vegetation and/or one of the key eucalypt species present as a dominant species within the site, plus an assessment of bushland quality]. Andrich, Mark A. and Jörg Imberger, 2013. “The effect of land clearing on rainfall and fresh water resources in Western Australia: A multi-functional sustainability analysis” in International Journal of Sustainable Development & World Ecology. Vol. 20 (2013): 549-563. Hochman, Zvi, David L. Gobbett, and Heidi Horan, 2017. “Climate trends account for stalled wheat yields in Australia since 1990.” Global Change Biology 23 (5): 2071 – 2081. Beyond Zero Emissions, 2014. Zero Carbon Australia Land Use: Agriculture and Forestry Discussion Paper. Melbourne: Melbourne Sustainable Society Institute, The University of Melbourne, pp. 42-53. National Reserve System Task Group, 2009. Australia’s Strategy for the National Reserve System 2009–2030. Endorsed by the Natural Resource Management Ministerial Council. Canberra: Australian Government, 74 pp. Note: IBRA - Interim Biogeographic Regionalisation for Australia. Weblink: http://www.environment.gov.au/land/nrs/science/ibra/ibra7-codes (Accessed 20 April, 2017). Eckersley, Richard, 2013. Repairing and preparing Australia’s landscapes for global change: Why we must do much more. Canberra: Australia21 Ltd., 32 pp. Miller, N.A., and J.H. Stillman, 2012. “Physiological Optima and Critical Limits.” Nature Education Knowledge 3(10):1. VanDerWal, Jeremy, Cassandra James, Doug Ward, Samantha Capon, and Lauren Hodgeson, 2013. “Identifying Climate Change refugia for freshwater biodiversity across Australia.” Abstract - Presentation at the NCCARF Climate Adaptation 2013 Knowledge+Partnerships Conference, Sydney, NSW, June. Australian Bureau of Meteorology, and CSIRO, 2016. State of the Climate 2016. Canberra: Australian Government, p. 5. Garnett, Stephen, Don Franklin, Glenn Ehmke, Jeremy VanDerWal, 2013. “Climate change and Australian birds - adaptation for the next half century.” Abstract - Presentation at the NCCARF Climate Adaptation 2013 Knowledge+Partnerships Conference, Sydney, NSW, June. Frappell, P.B., and C.B. Daniels, 1991. “Temperature effects on ventilation and metabolism in the lizard, Ctenophorus nuchalis.” Respiration Physiology 86(2):257-70. Holt, E.A., and S. W. Miller, 2010. Bioindicators: Using Organisms to Measure Environmental Impacts. Nature Education Knowledge 3(10):8. Fitzsimmons, James, and Geoffrey Wescott, 2001. “The Role and Contribution of Private Land in Victoria to Biodiversity Conservation and the Protected Area System.” Australian Journal of Environmental Management 8 (3):1. Reside, A.E., J. VanDerWal, B. L. Phillips, L. P. Shoo, D.F. Rosauer, B. J. Anderson, J. A. Welbergen, C. Moritz, S. Ferrier, T. D. Harwood, K.J. Williams, B. Mackey, S. Hugh, Y. M. Williams, and S. E. Williams, 2013. Climate change refugia for terrestrial biodiversity: Defining areas that promote species persistence and ecosystem resilience in the face of global climate change. Gold Coast: National Climate Change Adaptation Research Facility, 216 pp. Reside, A.E., et. al. 2013. ibid, p.45.